We cooked Ecuadorian Lamb Stew, a Supercook dish we hadn’t done for a long time. Cubed lamb is cooked with onion, garlic, tinned tomatoes, red and green peppers, chilli powder, coriander seeds, white wine and fresh coriander leaves. 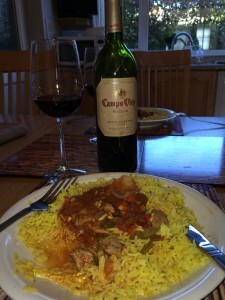 The stew is served on a bed of saffron rice. There was a little sweetness to the dish and we fancied a red wine with some sweetness to match. We’d read that Chateau Galès Graves 2011, a red Bordeaux from Lidl had a little sweetness. 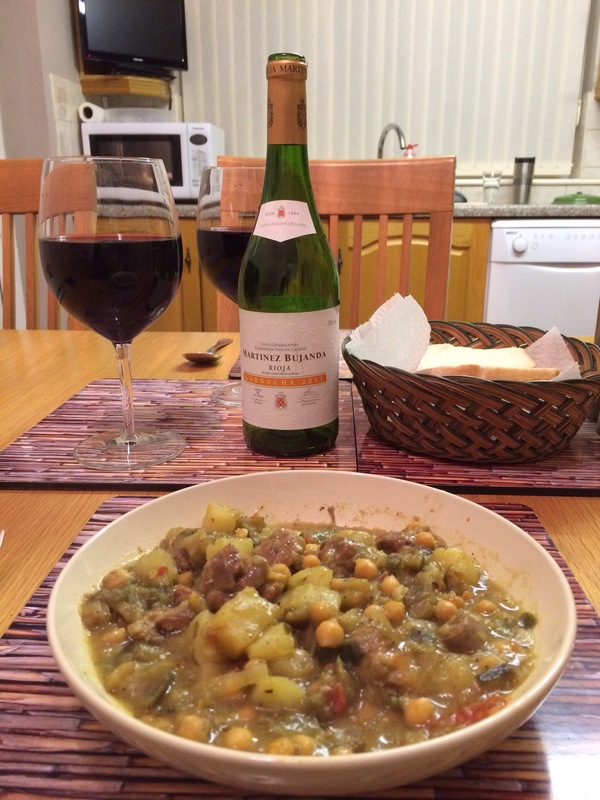 I thought it coped reasonably well with the meal but Teresa didn’t think it worked, so we set the wine aside. We tried a bottle of Campo Viejo Rioja Gran Reserva 2005, a medium-bodied Spanish red from Costco. We detected spicy red fruits and dark chocolate on the nose, followed by red berry fruits and spicy chocolate on the palate. The finish was lingering. A very good match with the lamb. 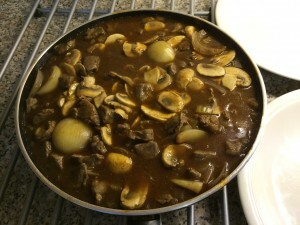 We cooked Sauté d’Agneau (Lamb Sauté) from Supercook. Cubed lamb is casseroled with onions, celery, tomato purée, grated lemon rind, mushrooms, red wine and beef stock. 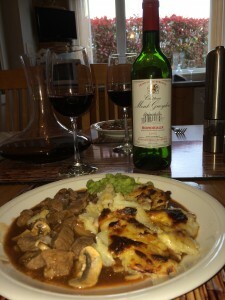 We served the lamb with Dauphinoise potatoes and mushy peas. 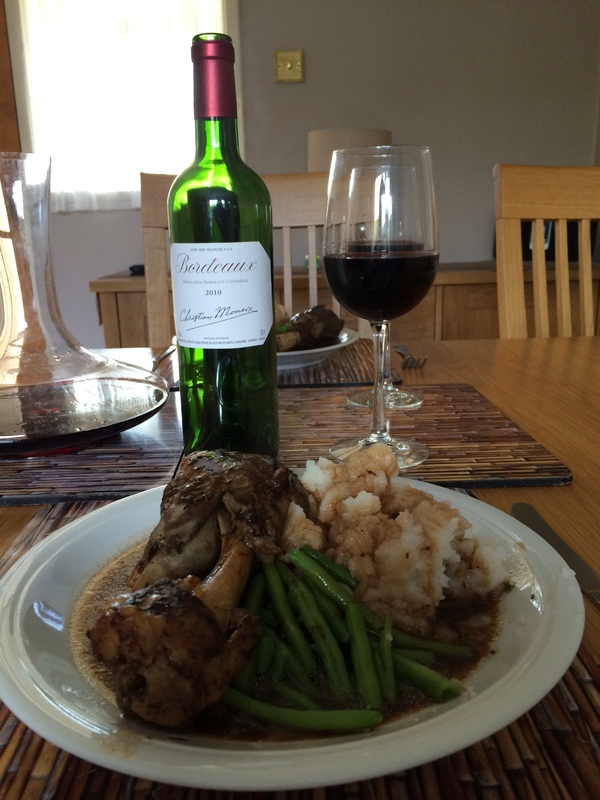 We chose a bottle of Chateau Mont Gueydon 2005, a red Bordeaux from the Sunday Times Wine Club to pair with the meal. This Cabernet-based blend delivered black fruits on the nose, followed by predominantly blackcurrant flavours, restrained tannins and vanilla sweetness. 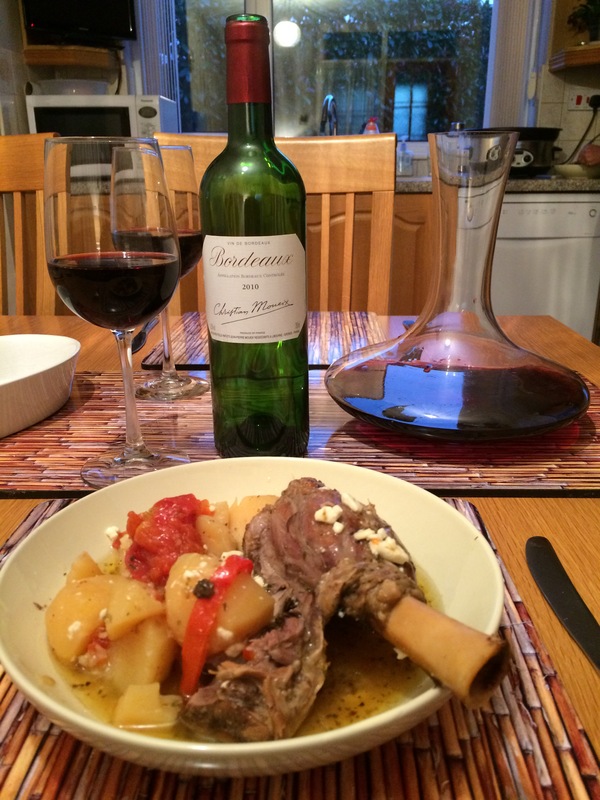 The wine was a very good match with the lamb. To drink with the leftovers we tried another wine from the Sunday Times Wine Club, Venta Real Grand Reserva 2005, a medium-bodied Spanish red made from Tempranillo. This displayed red fruits on the nose and also on the palate, with a spicy vanilla sweetness. This wine was also a very good match with the lamb. We cooked an old favourite from Supercook, Lamb and Mushroom Stew. Cubed lamb is tossed in flour seasoned with salt, pepper and dried rosemary. 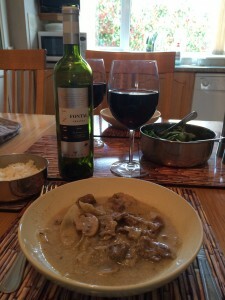 The lamb is then stewed with onions, mushrooms, chicken stock and sour cream. We used a little less sour cream than suggested, but replaced it with some Crème fraîche. We served the stew with rice and green salad. We opened a bottle of Fontal Crianza Tempranillo/Cabernet Sauvignon 2008, a medium-bodied Spanish red from the Sunday Times Wine Club. We detected powerful fruits on the nose followed by lovely red and black berry fruit flavours, smooth vanilla and a spicy finish. 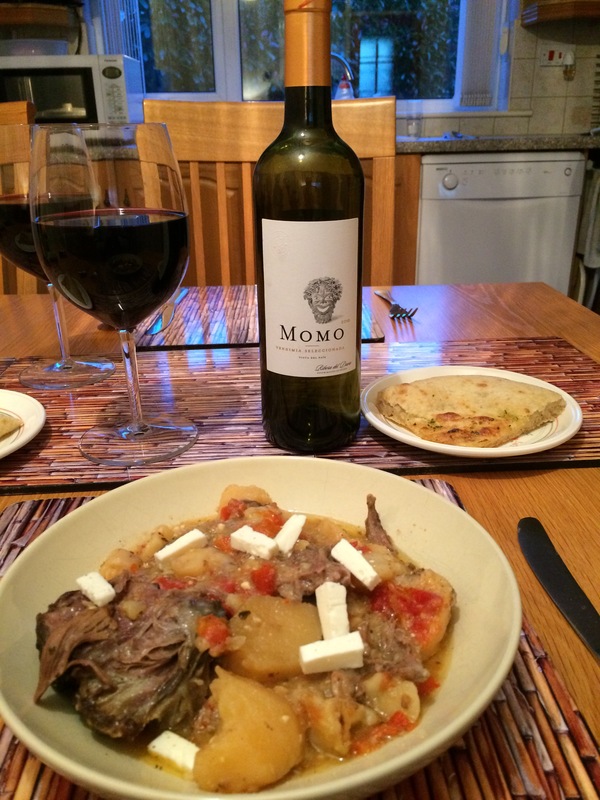 The wine was a very good match with the lamb. 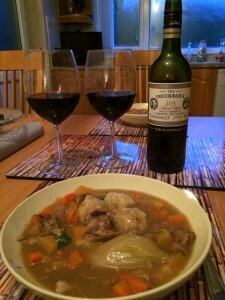 We found a recipe on BBC Food that looked good for a cold evening – Lamb Stew with Rosemary Dumplings by Bryn Williams. 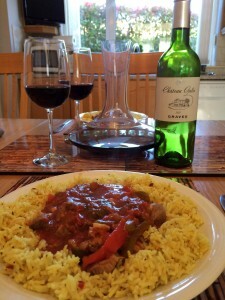 The recipe is for Neck Fillet, but we used cubed leg of lamb and cooked it for longer. The lamb is cooked in the oven with onions, carrots, swede, white wine, rosemary, bay leaves and lamb stock. The dumplings are cooked separately in lamb stock at the end and the meal is garnished with parsley. We opened a bottle of The Governor’s Petit Verdot/Cabernet Sauvignon 2008, an Australian red from the Sunday Times Wine Club. The wine was rich and smooth with blackcurrants, red fruits and vanilla sweetness on the finish to complement the carrots and swedes. A very good match with the meal. 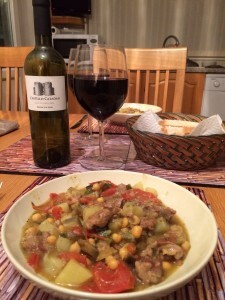 The following day we enjoyed the leftovers with a bottle of Ribero del Duero Tempranillo Reserva 2009, a full-bodied Spanish red from Tesco‘s Finest range. We again tasted vanilla sweetness, but this time there was spiciness and flavours of plums and blackcurrants. 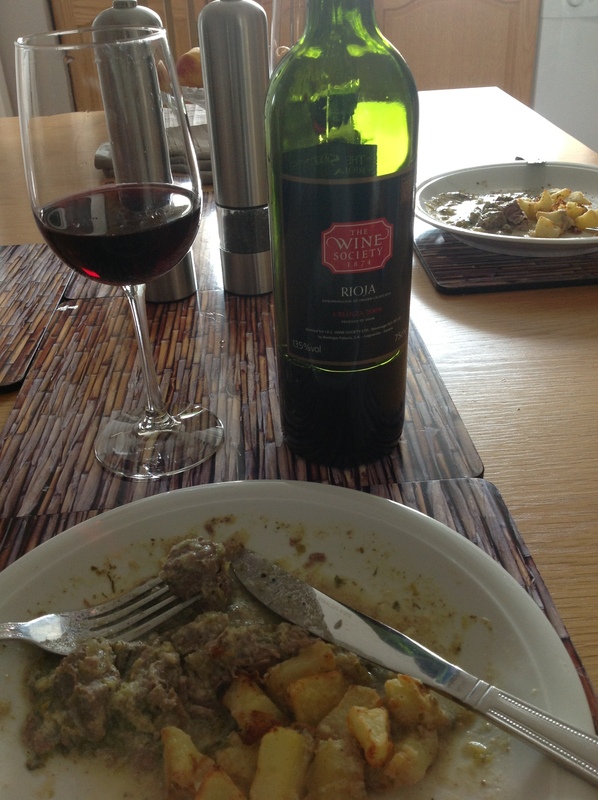 The wine was an equally good match with the lamb. We had a family meal and cooked Navarin of Lamb from the Slow Cook Book. 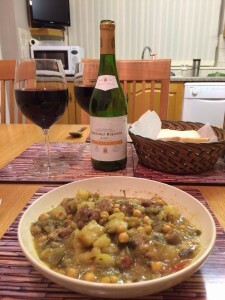 This springtime stew contains cubed lamb, baby onions, tomato puree, ground cloves, bouquet garni, stock, small new potatoes, turnips, tomatoes, baby carrots, french beans and a parsley garnish. 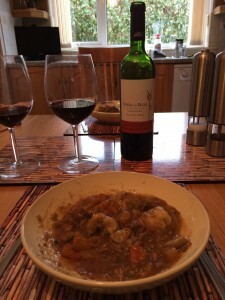 To be honest we have tasted better Lamb Navarin recipes. This one was a bit bland for us. We paired two red wines with this dish. 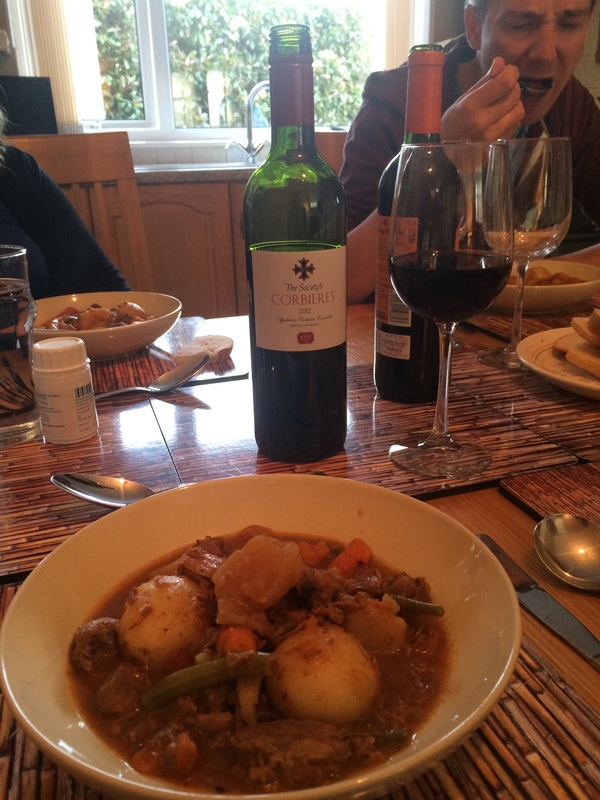 First, The Society’s Corbières 2012, a full-bodied Southern French red blend of Carignan and Grenache from the Wine Society. We tasted strawberry fruits and a sweetness that had an affinity with the turnips and carrots. We found the finish smooth. A good match. Second up was a bottle of Campo Viejo Rioja Reserva 2008, a medium-bodied Spanish red from Costco. The wine is a blend of Tempranillo, Graciano and Mazuelo and the black fruits and chocolatey edge were also good with the stew. However, we all thought the Corbières was the better match. 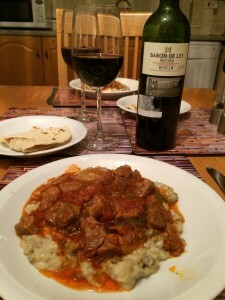 It had been a while since we cooked Lamb Fricassée from Jamie Does. The lamb cubes are cooked with onions, garlic, lettuce, dill, seasoning and Greek yoghurt. The lovely rich Greek flavours are enhanced by mixing in avgolemono (egg yolks and lemon). We served this with little roast potatoes. We love this meal and by the time I remembered to take a photo we’d eaten half of it. This time though we opened a bottle of The Society’s Rioja Crianza 2009, a medium-bodied Spanish red from the Wine Society . We detected red fruits on the nose followed by flavours of red fruits, vanilla oakiness and a creamy smoothness, with soft tannins. This was an excellent match with the meal and probably the best we have achieved so far.